Alice Duer Miller (July 28, 1874 – August 22, 1942) was a writer from the U.S. whose poetry actively influenced political opinion. Her feminist verses made an impact on the suffrage issue, and her verse novel The White Cliffs encouraged U.S. entry into World War II. She also wrote novels and screenplays. Alice Duer was born in New York City on July 28, 1874, into a wealthy family. She was the daughter of James Gore King Duer and Elizabeth Wilson Meads, the daughter of Orlando Meads of Albany, New York. Her great-grandfather was William Alexander Duer, President of Columbia College. Her great-great-grandfather was William Duer, an American lawyer, developer, and speculator from New York City. He had served in the Continental Congress and the convention that framed the New York Constitution. In 1778, he signed the United States Articles of Confederation. Her great-great-great-grandfather was William Alexander, who claimed the disputed title of Earl of Stirling and was an American Major-General during the American Revolutionary War. She was also a descendant of Senator Rufus King, who was an American lawyer, politician, and diplomat. He was a delegate for Massachusetts to the Continental Congress. He also attended the Constitutional Convention and was one of the signers of the United States Constitution on September 17, 1787. By the time of her entrance into society, her family had lost most of its fortune. She entered Barnard College in 1895, studying Mathematics and Astronomy. She helped to pay for her studies by selling novels and short essays. She and her sister Caroline jointly published a book of poems. On October 5, 1899, she married Henry Wise Miller at Grace Church Chapel in New York City. He was born in 1877, the son of Lt. Commander Jacob Miller in Nice, France, where his father had been serving with the U.S. Navy. 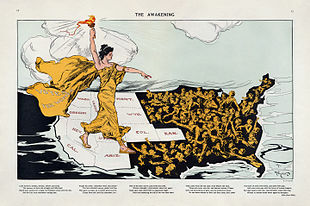 Illustration for one of Miller's suffragist poems, as published in Puck in 1915, showing women's suffrage moving east from the states in the west that had first adopted it. They moved to Costa Rica, where he attempted to develop rubber cultivation, which eventually failed. In 1903, she, Miller and their young son returned to New York. Her marriage lasted to the end of her life, but it was not tranquil. "FATHER, what is a Legislature?/ A representative body elected by the people of the state./ Are women people?/ No, my son, criminals, lunatics and women are not people./ Do legislators legislate for nothing?/ Oh, no; they are paid a salary./ By whom?/ By the people./ Are women people?/ Of course, my son, just as much as men are." She followed this collection with Women Are People! (1917). Her novel in verse Forsaking All Others (1933) about a tragic love affair, and many consider her greatest work. In the 1920s and 1930s, many of her stories were used for motion pictures, such as Are Parents People? (1925), Roberta (1935), and Irene (1940), taking her to Hollywood. She also became involved in a number of motion picture screenplays, including Wife vs. Secretary (1936). Her name appears in the very first issue of The New Yorker as an advisory editor. The poem was spectacularly successful on both sides of the Atlantic, selling nearly one million copies – an unheard of number for a book of verse. It was broadcast and recorded by British-American actress Lynn Fontanne (with a symphonic accompaniment), and the story was made into the 1944 film The White Cliffs of Dover. Alice Duer Miller died in 1942 and was interred at Evergreen Cemetery in Morristown, New Jersey. ^ Robert F. Jones, "The King of the Alley": William Duer; Politician, Entrepreneur, and Speculator, 1768–1799 (1992), p. 1; Jonathan J. Bean. "Duer, William"; American National Biography Online, February 2000. Older sources give Duer's year of birth as 1747. ^ Duer-Miller Wedding." New York Times, October 6, 1899. ^ Chapman, Mary (Spring 2006). ""Are Women People?" Alice Duer Miller's Poetry and Politics". American Literary History. 18 (1): 59–85. doi:10.1093/alh/ajj003. JSTOR 3568047. ^ Morey, Anne (Fall 2010). "A New Eroticism or Merely a New Woman? Cecil B. DeMille's Adaptation of Alice Duer Miller's Manslaughter". Framework: 388–403. ^ "Advisory editor". New Yorker. 1 (1): 1. February 21, 1925. ^ Alice Duer Miller profile, findagrave.com; accessed September 16, 2015. 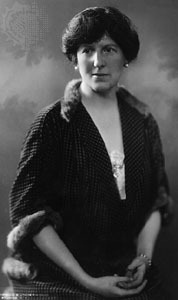 Wikimedia Commons has media related to Alice Duer Miller. This page was last edited on 6 March 2019, at 19:03 (UTC).